The 2012 election, then, can be seen as a referendum on Obama’s presidency — a test he passed yesterday in impressive fashion — and a referendum on the liberal experiment. It’s what makes the president’s electoral success, not just significant in the short term, but important in the long term. Obama’s agenda has a new opportunity to make a meaningful, positive difference in the lives of America’s middle class, but it also establishes a precedent for history — presidents can pursue big, bold, consequential priorities, and be rewarded for it. Let’s consider exactly what this means — and why the question itself is rather dubious. I understand the point, but I’m not sure it matters. For one thing, Obama really did present a relatively detailed agenda, which includes measures that are quite popular with the American mainstream. 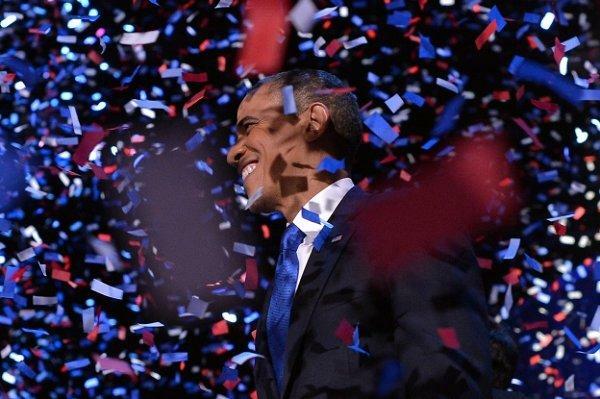 For another — and this is important — Obama won big. Once Florida is called, the president will end 2012 with 332 electoral votes and a majority of the popular vote. To put that in context, Obama easily surpassed George W. Bush’s two victories — and Republicans had no problem saying he had a mandate — and is now the most successful Democratic presidential candidate since FDR (Clinton won twice, but came up short of popular-vote majorities both times). I don’t imagine congressional Republicans would care if the president had won 538 electoral votes — which makes the debate over mandates itself something of a moot point — but if anyone has earned the right to a fair hearing of his policy priorities, it’s Barack Obama.